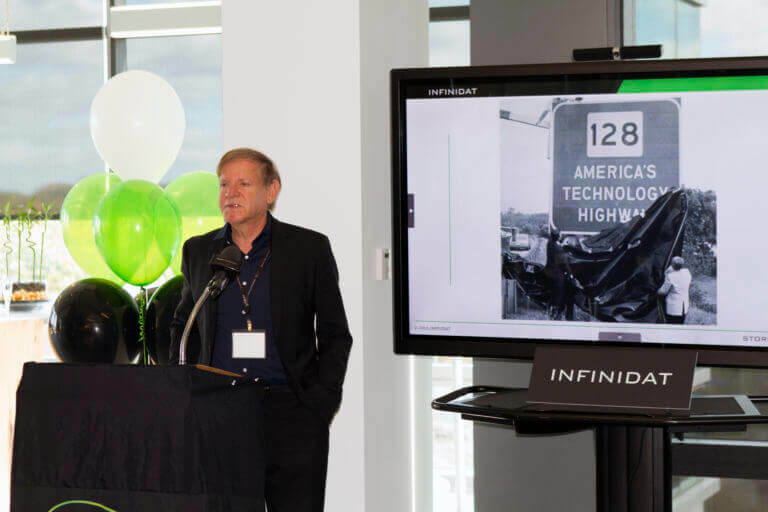 Today, you can see a green glow emanating from the top floor of the gleaming new office building just off Exit 27 of Route 128 — it’s the brand new home of INFINIDAT’s U.S. headquarters, and the focus of our grand opening celebration. 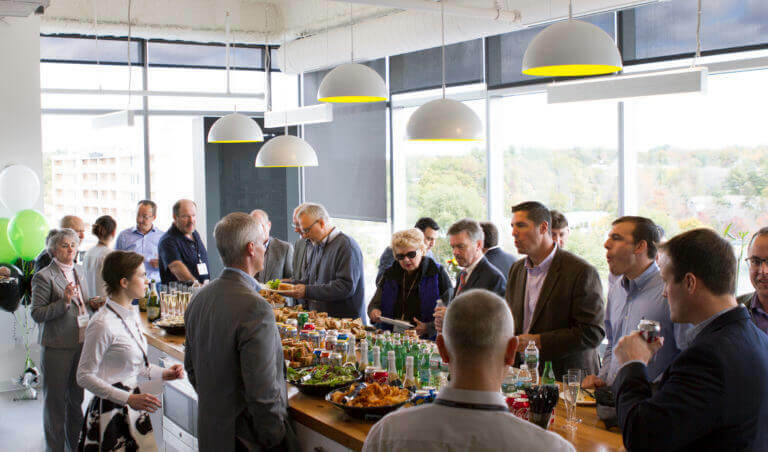 During the festivities, INFINIDAT founder and CEO, Moshe Yanai, and President, Izhar Sharon, played host to our customers, partners and employees, and welcomed distinguished guests such as State Representative, Tom Stanley, Massachusetts Secretary of Housing and Economic Development, Jay Ash, and Mayor McCarthy, all of whom were on hand to help commemorate our new space. 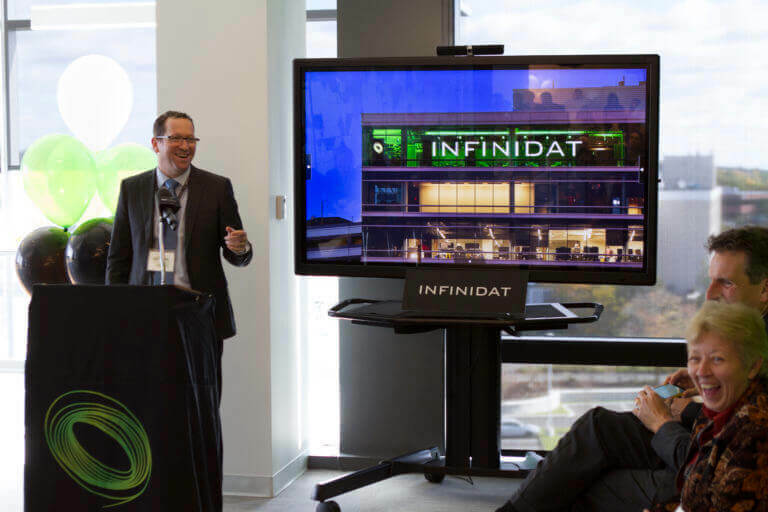 INFINIDAT’s new U.S. headquarters aglow in green. 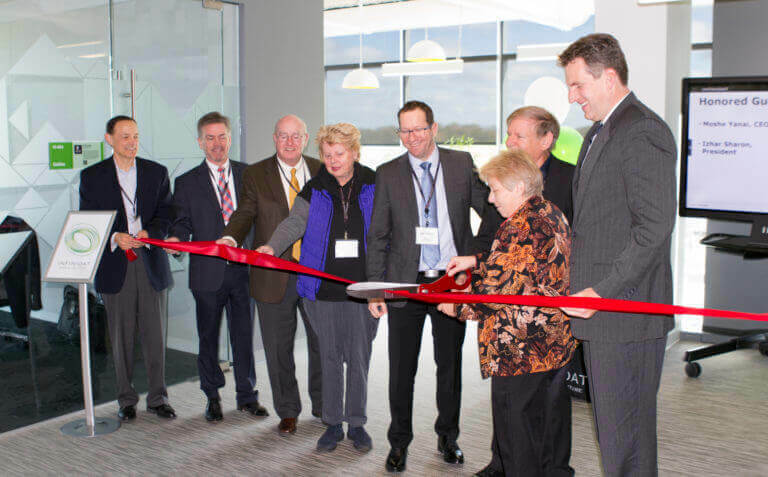 INFINIDAT’s ultra-modern 23,000 square foot facility, with a design aesthetic that Mayor McCarthy thought was inspired by “The Jetsons,” will be home to our global marketing, business operations, US sales, service and support, and expanding development organizations. The state-of-the-art data center is a model of resiliency and sustainability with enough capacity, 75PB, in its small, 750 sq. ft. footprint to store the human genomes of the entire population of the United States. Visitors to the Executive Briefing Center can tour the data center, grab a snack in the customer cafe, and check out the “patent wall” — a vibrant and growing testament to the wealth of innovations that make INFINIDAT’s enterprise storage solutions so unique. Formally cutting the ribbon to celebrate the grand opening. INFINIDAT has made Massachusetts its U.S. home since 2011. Given the state’s access to a highly-trained and educated workforce, proximity to services, supportive business climate, and strategic location and transportation connections, particularly to the company’s offices in Israel and the U.S. west coast, Massachusetts makes an ideal home. In his remarks, Secretary Ash cited Massachusetts as innovation success story — with the establishment of our new U.S. headquarters, we hope to add to that success. Guests enjoy the customer cafe in the Executive Briefing Center.